Travel to Cebu and never forget Magellan's Cross in your own Cebu tours. Cebu City is well within the bountiful island of Cebu in Central Philippines (or Visayas region). It is the oldest city in the Philippines with some of the oldest landmarks and ancestral houses. Cebu City is an ideal destination for a heritage tour, but it’s not limited to its old landmark domains. Cebu tours may also include nature adventures, adrenalin rush adventures and underwater escapades. The province alone is an all-in-one tourist destination ever, packing all the things tourists may opt to choose. And for that, I have here some simple reminders and things you may consider before traveling to Cebu and have fun with your Cebu tour. Cebu Heritage Monument near Colon Street, Cebu City, Philippines. THE TOUR. Almost everyone who had never been to Cebu but wanted to visit this place always lists Magellan’s Cross as their main tourist spot that they should be able to visit. What is Cebu City without Magellan’s Cross anyway? It’s like Baguio City and Burnham Park linked together. If so, planning the “heritage tour” is best for you. If you think Magellan’s Cross is the only old landmark located in Cebu, think twice. Cebu has a lot of old landmarks that packaging a single tour to all of its tourist spots is an ideal one! Draw back in time and deal with Cebu heritage tour. Unless you are looking for an adventure other than heritage walk tours, then going out of the city and choosing your adventure is for you. One of the oldest ancestral houses in Cebu City is the Yap-San Diego Ancestral House. THE CITY. Cebu City is like any other cities in the country. It’s like a smaller Manila in terms of land area. And when we say city, it’s Cebu City. Cebu (the province) has Metro Cebu which consists of other key cities in the province like Cebu City itself, Mandaue City, Lapu-Lapu City and the others. When you visit Cebu and saw the urban city, it feels like it was Cebu City at all, where in fact going to Cebu City (from the airport) passes through the cities of Lapu-Lapu and Mandaue. And before you actually reach Cebu City, you are not yet in Cebu Island. From Mactan Island where the airport is located, you still have to reach Mandaue City before you officially land on the island of Cebu. THE HOTEL. If you plan to travel to Cebu and visit all the tourist spots for your Cebu tour, then you have to consider the location of your hotel. You might as well consider your budget for this, but for me the location stands first before the price. If your hotel is very far from the tourist destinations, it defeats the purpose of budgeting your time and money as well since it may double your expenses on fares. Online buying sites offer cheap Cebu transient rooms and inns but you have to check your map if they are still within Cebu City, or else you will have to spend some time just searching for their locations. Besides, hotels located near the central district or market means more accessible to transportation, food and shopping needs. The hotel where I checked in for two nights was Sampaguita Suites in Plaza Garcia (not in Fuente Osmeña) .You can actually use and search for hotels via Travex Travels, just hit our live search located at the bottom of the post (or at the right side bar). THE TRANSPORTATION. If you want to tour Cebu on a budget then you have to get away from using cab services. Taxi rate in Cebu is P40 with additional P2.50 for every cycle (metered taxi). This means going to Taboan Market where the dried fish (danggit) are sold is like P85 away from SM City Cebu via taxi. And this means a lot when you tour the other tourist spots via taxi. Though other attractions like Taoist Temple require you be on a taxi when you go there (habal-habal or trikes are not allowed inside the temple), it is more practical to know some jeepney routes for a more affordable Cebu trip. Basilica de Sto. Nino near the Magellan's Cross in Cebu City. THE LANGUAGE (OR DIALECT). When I visited Cebu on my last travel, I was “language shocked” or culture shocked in terms of the language (or whatever you may call that). For foreign tourists this is nothing new, but for travelers who happen to come from Luzon like me, it was some kind of a new discovery. Honestly, I actually had a hard time making conversations with the local Cebuanos as they always incorporate Cebuano terms (or Bisaya) whenthey talk to me in Tagalog. For travelers who want to go to Cebu, at least learning a bit of Bisaya would be helpful (like basic numbers and greetings). Or you can talk to them in English (I guess they are better off with that as I noticed they hold masses in Sto. Niño in both Cebuano and English). In Baguio, most local people speak Ilocano but I didn’t have a hard time talking to them in Tagalog. I guess the Cebuanos’ culture which is still intact makes the difference. Besides, Baguio is nearer to Manila where people speak Tagalog. Oh yeah the geography and like that, I don’t have to explain the phenomenon. "CEBU" in front of the Islands Souvenirs shop. NORTH OR SOUTH. If you plan to visit Cebu’s hidden gems, wonderful beaches, tantalizing falls, mysterious caves and friendly giants, then you have to decide whether to go north of Cebu or south of Cebu (remember that long strip of Cebu Island?). North of Cebu has white sand beaches like the ones in Bantayan Island and Camotes Island (where I had my nature adventure trip ^^,). Both the islands of Bantayan and Camotes are located north of Cebu, and for that, you have to go to the North Bus Terminal in Cebu City on your transportation. North of Cebu also offers diving sites like the one in Malapascua. On the other hand, south of Cebu hasKawasan Falls in Badian and another diving site in Moalboal. Oslob, where the emerging tourist attraction of near life encountersto friendly giants “butanding”, is also located south of Cebu. THE TIME MANAGEMENT. Touring Cebu City alone cannot be done in just one day, so you need to manage time for this. I guess three days in Cebu will already be good enough to visit most of its tourist attractions for the heritage walk tour plus choose a one-day out-of-town trip somewhere north or south of Cebu. 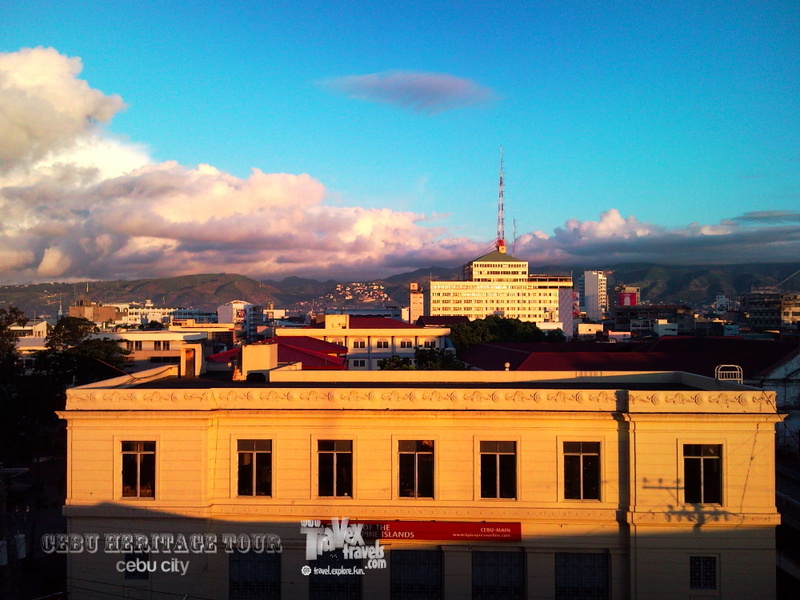 Meet Cebu City's bustling urban life with a refreshing burst of sunrise on a city and mountain backdrop. THE FOOD. Food is no exception, and Cebu food and dishes are the ones of the many best that I tasted. Baked scallops and the “sutukil” style will complete your Cebu experience, together with unique “puso” rice and Cebuano style chicken inasal. I actually ate seafood that I cannot remember now the name. Haha, it’s like squid but it’s not. I should have asked that one there. Cebu's Colon Street obelisk (oldest street in the Philippines). THE BUDGET. Touring Cebu is not expensive I tell you, as it will give you the best of the best experiences. Though some of the tourist spots have entrance fees, the fees don’t go as high as P50. The transport fare is okay and when you go for nature, it’s the same. The white sand beaches are free of course, and when I visited Danao Park, I only paid for the kayak rental of P50 (which is cheap). And man, the lake was awesome! Rowing a boat in Burnham Lake was good, but rowing a kayak in Danao Lake was so good! Something extraordinary and relaxing. So there, I just presented you a simple list of things you may consider when you have your travel to Cebu. Just though remember that the other things are for you to discover when you are already in Cebu, so go ahead and enjoy life traveling, exploring and having fun in the Philippines! Cille Anne of Penfires (www.penfires.com) for helping me out in our own Cebu itinerary. Sampaguita Suites Plaza Garcia for the simple requests and friendly staff I really did appreciate when I was there. Wow! This is amazing. I really love your blog.